But then I stumbled on an awesome project where designer Nicole Meyer is Branding 10,000 Lakes. Talk about daunting. She writes that by doing one logo every day, it should only take, oh roughly 27 years! I love the clean and contemporary style of her work and am truly in awe of this kind of ambitious undertaking. Luckily this should not take me nearly as long, but I like the idea of this kind of commitment to something. A project just for myself, a challenge I set just for me, but something I have to finish. So here goes. This is the first, one down, 99 to go! 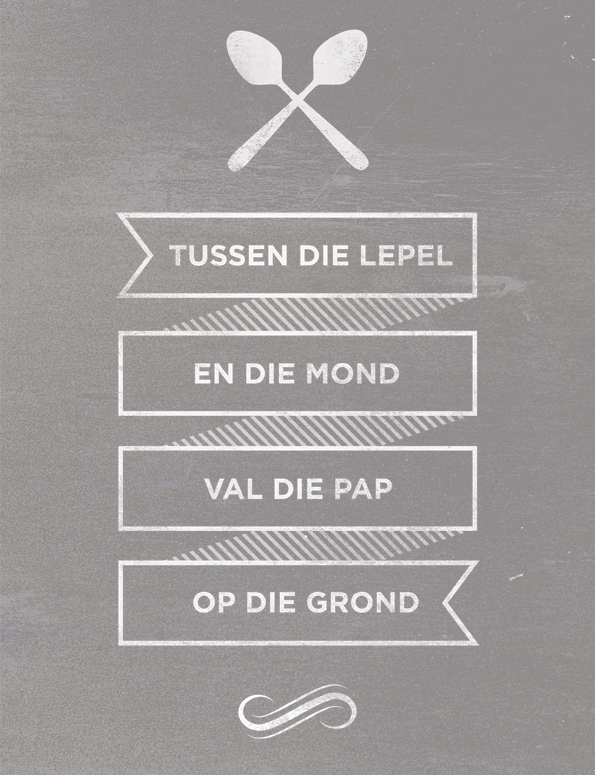 This is Afrikaans idiom “Tussen die lepel en die mond val die pap op die grond”, roughly translated, means that you should never be too sure of anything. Sjoe you have set yourself quite a challenge, but I must say that your first poster looks fantastic! Looking forward to the other 99. Jy slaan my asem weg! Dit is n klomp hooi op jou vurk. Maar ek wil nie die bobbejaan agter die berg gaan haal nie. Kort voor lank is jy op die hond se stert. Hou die blink kant bo! What a great way to immortalise some traditional wisdom! !